Is it too Hot to Crochet? Summer is truly here now. Even up on my mountain we are feeling the heat. Of course what seems “hot” to us is nothing compared to what friends and family all over the country are dealing with. This past week temperatures have been over 100F in lots of places. Making me very grateful for our easy days of 87-90F days at my house. When I go down to town to do errands it can be significantly warmer. But at least in Colorado humidity isn’t the factor that it is for many others. I’m looking forward to seeing all my yarnie friends at the conference in a few weeks, but it will be in Charleston, South Carolina. I suspect that I may be melting in the heat and humidity that they are experiencing. In heat like that how does one keep crocheting? My choice for travel and for hot weather crochet is to work with small projects. If afghans are your favorite type of project this is the time of year to tackle a motif afghan that requires lots of smaller pieces to be completed before being all sewn or crocheted together. The motifs are great projects to carry along with you to the beach and outings thru the summer. Then when the cooler weather finally rolls around you can do the joining work to make them into an afghan. 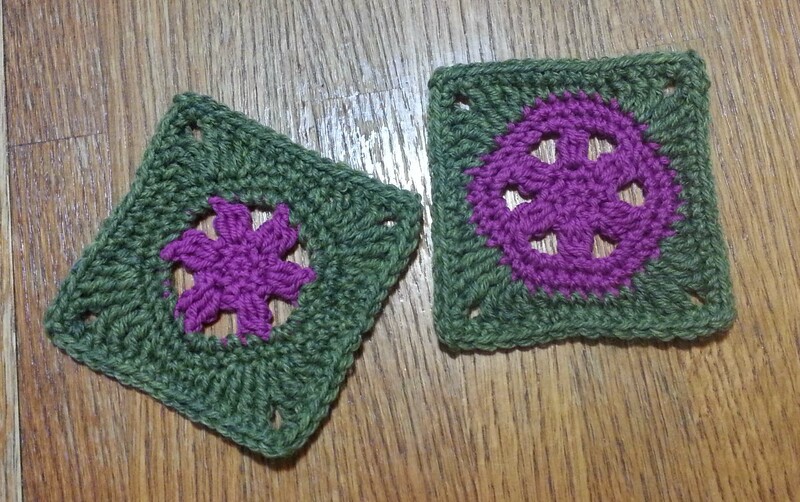 If you want some fun motifs to play with try my “Annetta Square” here on the blog. Or my “Hot Spot Square”. I often take advantage of the warm weather season to get ahead on my holiday gifts. I work on my cotton thread snowflakes. They are fun and relatively quick projects that don’t take up a lot of room in my project bag. I can get a nice stack of them finished up before the hot weather is over with. The stiffening stage goes faster too as they dry super fast in the warmer weather. 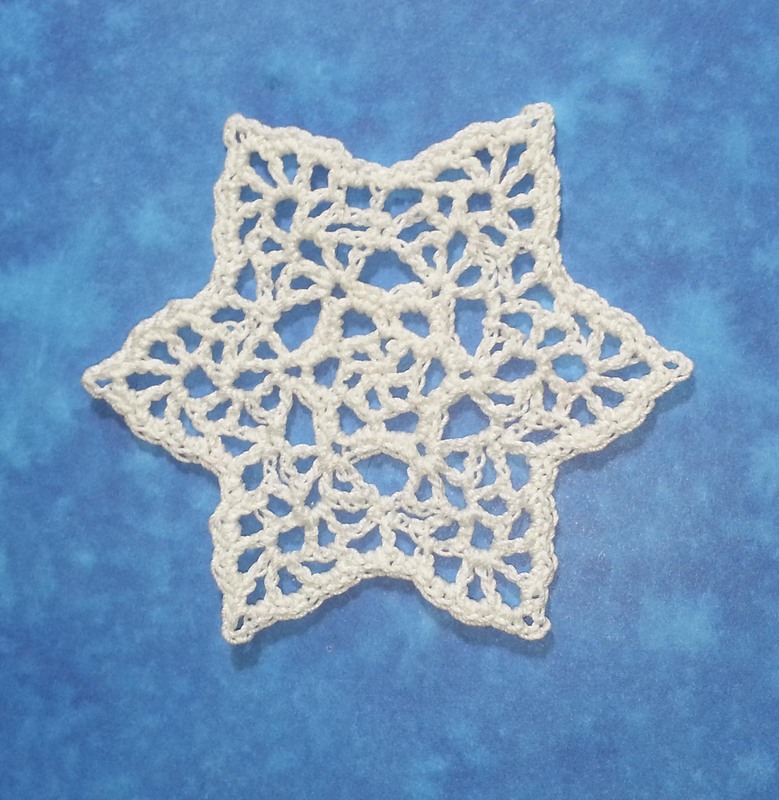 I’ll be making quite a few of my snowflake pattern “Lacy Snowflake” that I designed for last December. You can find the pattern here on the blog. Who knows, maybe you’ll feel cooler crocheting snowflakes. My very favorite projects for gift-giving and small project crochet are Hats. All my boys (including Himself) love getting hats for Christmas. I made a hat for my Dad a couple of years ago for Christmas and it was well received too. I also like making hats for various charities. I’ve taught classes on crocheting hats at my local LYS and will be teaching my “Perfect Fit Crocheted Hat” class at the Scotts Bluff Valley Fiber Arts Fair this September. 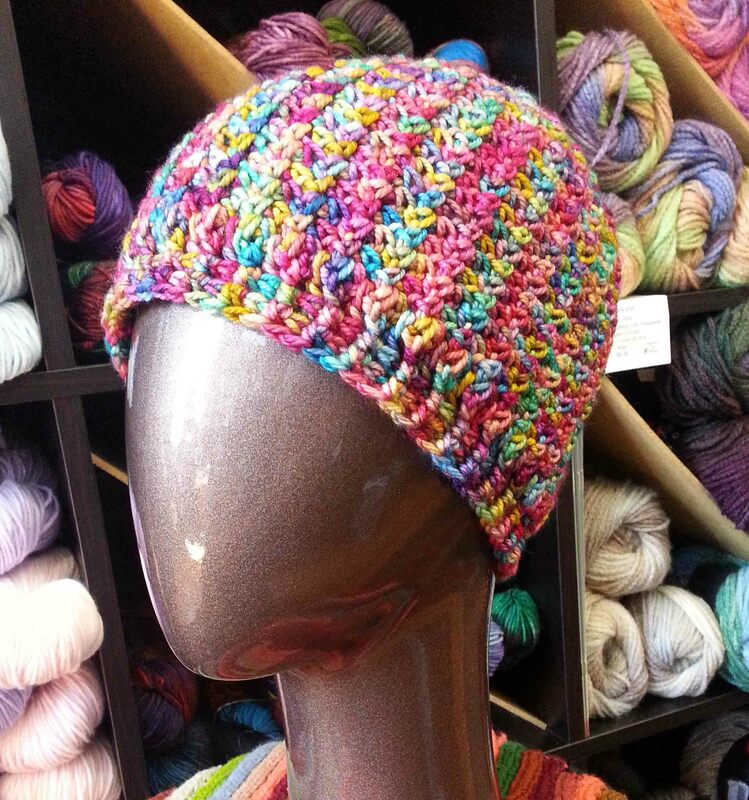 I also have a couple of other hat patterns in my M2H Designs line. This is my “Spiraling Crosses Hat” and is made in a slightly mesh like stitch pattern that allows for a combination of breathability and warmth. You can purchase the pattern for this hat in my Ravelry shop here. My newest M2H Designs pattern is the “Mountain Top Beanie” in my Ravelry Shop. 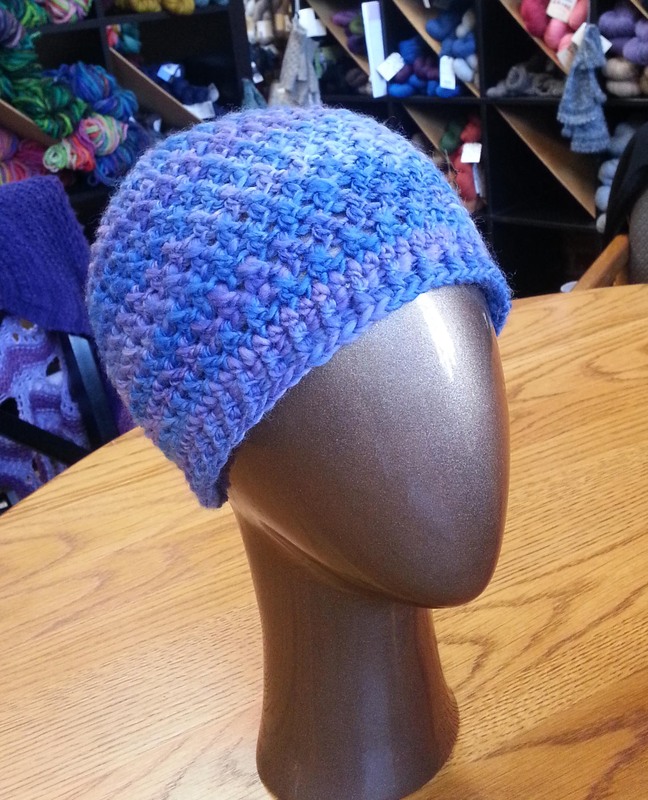 This hat is crocheted in a super stretchy all over stitch pattern that looks beautiful in variegated yarn or solid colors. I made this sample in Ella Rae Lace Merino Aran weight. This is a gorgeous yarn that was lovely to work with. I’m planning on taking my oldest son to the Longmont Yarn Shoppe to pick out the color he wants to make him a beanie to wear in the coming school year. This hat was one of the projects I was working on during our recent trip to Kansas for a big family reunion. The project fit entirely into one of my small project bags with room in the outside pocket for my phone. Worked great for a small crochet project to keep my hands busy while visiting with family. 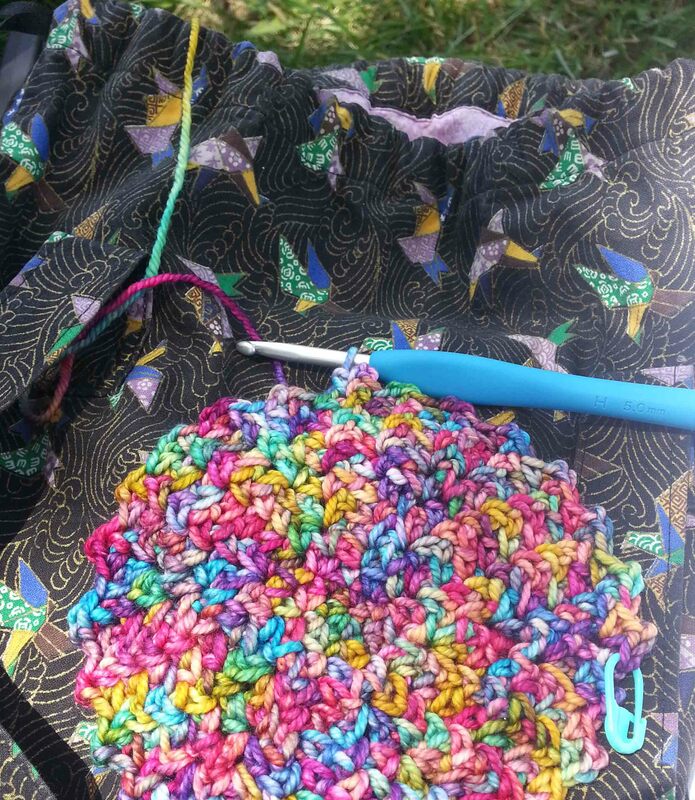 Most importantly it wasn’t too hot to work on as crocheting on a larger project could have been. So to answer the question I posed in my title today. No, it isn’t too hot to crochet. You just need the right project. Air conditioning is a good idea too. Stay cool all my Northern Hemisphere friends. For those of you in the Southern Hemisphere heading into your cold season we may soon be jealous of you. I love this post! It inspired me to pick up a project I started last year. It’s the Babette Blanket, designed by Kathy Merrick. Thank you for the inspiration! the mountain top beanie is so beautiful! I am from Australia and it gets pretty hot here in summer. I really struggle to stay engaged in crocheting, agree though, small projects are the only way to push through the heat! When it’s really hot you might want to also try crocheting on a small table. That keeps the project off your lap and allows some airflow. 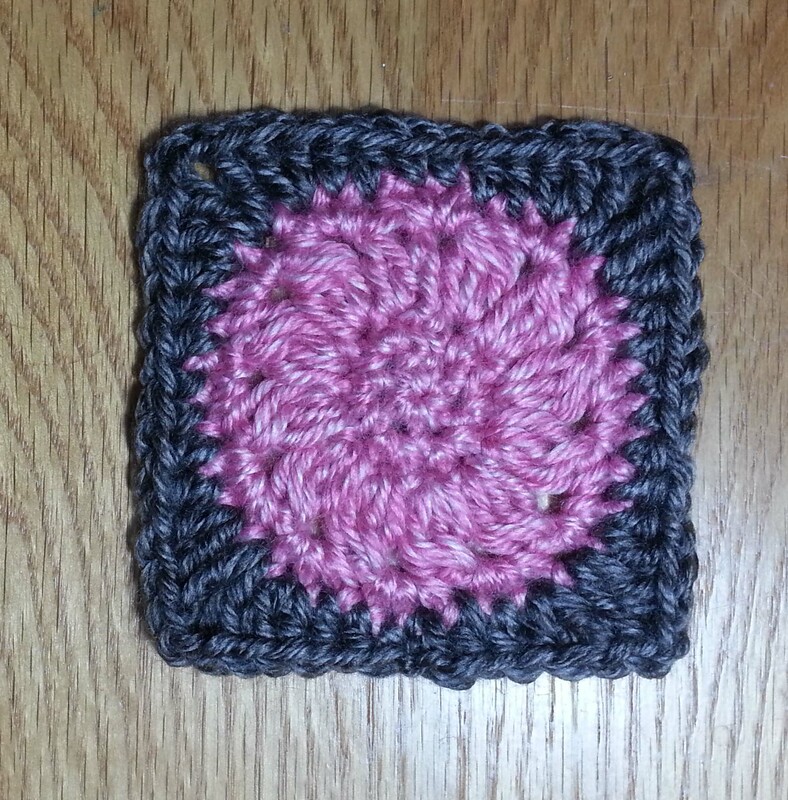 is there a written pattern available for the whirlwind afghan square?